Income drawdown, or pension drawdown, is a way of withdrawing the money you’ve saved into a registered pension scheme. Many use income drawdown as a way to provide themselves with a regular income throughout their retirement. 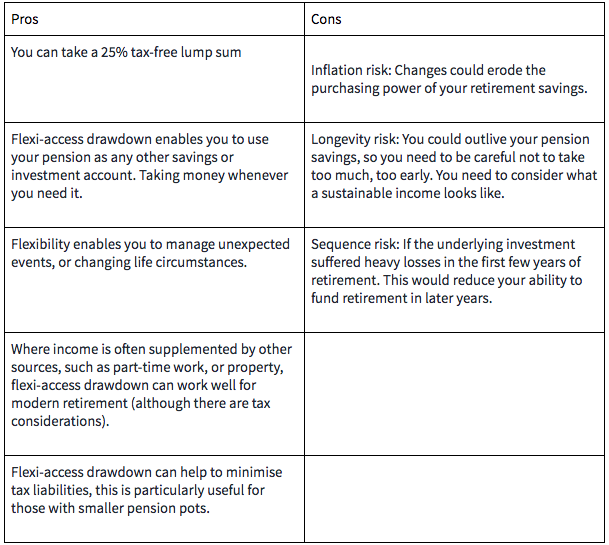 Often, pension savers will need to transfer to a pension provider, or fund, that offers an income drawdown feature. At Moneyfarm, our pension comes with a flexi-access drawdown feature as standard. This means that when you reach 55, you can enter drawdown from your pension at no extra charge. Some providers charge an additional fee for this, but our drawdown is covered by your management fees. What’s important to remember is that when your pension savings are gone, there’s no way to get them back, so it’s important you consider your options to avoid costly mistakes that could impact your quality of life further down the line. Income drawdown starts with you choosing how much money you’d like to take from your pension and when. 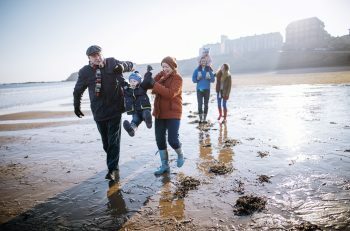 You can’t access any money in your pension until you reach the age of 55, although this age is set to rise to 57 in 2028 when the state pension age increases from 66 to 67. If you’re entering flexi-access drawdown, you can usually take up to 25% of the amount you’re accessing tax-free as a lump sum. You’ll then pay income tax on your withdrawals. To draw from your pension on a regular basis, this money needs to be with a provider that allows you to take income when it suits you. Not all providers offer this, so you’ll need to find out what your current pension provider offers. The beauty of income drawdown is that your pension stays invested as you withdraw from it. Research from Which? makes the assumption that you would often withdraw 5% a year, and your investment would grow by an annualised 4% a year over the length of your retirement. The cost of entering income drawdown is quite difficult to calculate as different companies have very different charging structures. At Moneyfarm you pay the Moneyfarm management fee and the underlying fund cost. This is the same during accumulation (saving for retirement) and decumulation (withdrawing from your pension). You could incur as many as five or six different types of costs when entering pension drawdown with other providers. These could include drawdown set-up charges, platform charges, fund fees, admin charges, and on top of this you may also need to pay a charge for trading. Which? simulated the charges somebody could face over a 15 year period on a £250,000 pension pot, again making the 5% withdrawal assumption and 4% investment growth assumption. At Moneyfarm, this would cost you £27,370 and at the end of the 15 years you would have £183,521 left in your pension. According to Which?, you could pay up to £11,000 more in fees at some providers and be left with £10,000 less at the end of the 15 years. Money taken from your pension is taxed at your marginal rate of income tax. This is not the tax you paid whilst working, but is instead calculated on the income you receive from your pension. You can take 25% of the amount you’re crystallising (putting in drawdown) as a tax-free lump sum when you enter drawdown and pay income tax on the remaining withdrawals. As part of your financial planning, you might decide to crystallise smaller parts of your pension pot into income drawdown as you go along instead of doing it all at once. When you take your lump sum payments, it’s then classified as part of your estate and could mean a large inheritance tax bill if you die. If you don’t take your tax-free lump sum, it will stay protected by your pension wrapper and it could be passed on tax-free if you die before the age of 75. If you enter drawdown whilst you’re still working (even if this is part-time) you could be placing yourself in a higher-rate tax bracket. So it’s vital that you look at the tax and understand what you’re paying. Pension providers are legally obliged to operate PAYE on all taxable pension payments. You should therefore give your pension provider your PAYE code (that HMRC send) to try and avoid emergency tax. Unfortunately, emergency tax is quite common on pension withdrawals. You can decide to take lump sum withdrawals from your pension, and you’ll get 25% tax free and the remaining balance will be subject to income tax. It’s important to consider the growth you need to see in your portfolio to ensure you have an income for as long as you need it. Remember longevity risk is a key consideration when planning your retirement income. You can also take your retirement savings and buy what is known as an annuity. This is when you swap your pension savings for a guaranteed income throughout retirement, you can also get short-term annuities. These are often offered by insurance providers and the rates offered can vary. There are also tax considerations with an annuity as only certain types of annuities can be inherited. Income drawdown is all about providing yourself with an income in later life and ensuring that you do this in a tax efficient way that works for you. Paying for advice before entering income drawdown could save you thousands in later life. An advisor would be able to help you calculate the amount you need each year, and which account you should take money from first. This could reduce the risk of taking too much from your pension too early. Unfortunately, Moneyfarm are unable to advise on pension drawdown. 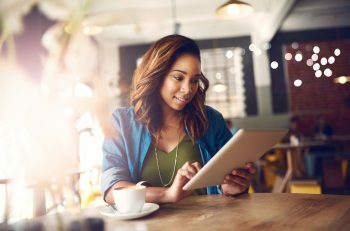 Often it’s worth looking at your ISA savings first before dipping into your pension (if you still have ISA savings when you want to draw from your pension). The tax allowance on this is based on the individual and therefore could be subject to inheritance tax when you pass away. Remember, you also have a personal tax allowance, which is £11,850 in the 2018/19 tax year. Previous article What is alpha?